PROCHE DE BEACH-BOARDWALK / 4 BDRM / 3. 5 BAINS / GRAND EMPLACEMENT! Vous recherchez une belle maison de ville à venir et se détendre ... alors nous avons l'endroit pour vous !! Notre nouveau 4 chambres, 3. 5 salles de bain townhome est le bon endroit pour vous. Il est situé au cœur de Ocean City, entre 12 et 13 Sts, deux pâtés de maisons de l'océan et une pâté de maisons de la baie. Fin unité sur la gauche, Unit # 4. Consultez le calendrier sur le site Web pour connaître les dates disponibles. 1 - lit king, 2 - lits queen, 1 ensemble de lits superposés (lit complet en bas et lits jumeaux sur le dessus), et un canapé-lit convertible (taille réelle). Garez votre voiture pour la semaine et profiter de toutes les attractions locales Ocean City a à offrir, plus à distance de marche. Ne vous sentez pas comme la marche ... vous pouvez toujours prendre le bus ou le tram ... rouler toute la journée pour une somme modique. Vous pouvez essayer certains des restaurants locaux .... Phillips Crab House, Macky de, BJ, Fishtails, boules de cuivre, Bahama Mamas, Harrison Hall, Layton, Dough rouleaux, Pickles, Harpoon Hanna parmi beaucoup d'autres. De plus, vous avez à essayer au moins une fois l'Fractured Prune. Ces beignets sont si bons! Les attractions locales comme le golf miniature, Jolly Rogers Parc d'attractions, Sports nautiques Paradise, la promenade à pied pour faire du shopping ou tout simplement naviguer, et plusieurs autres activités disponibles. Cet appareil est idéal pour les réunions de famille, des tournois sportifs, des semaines supérieurs, et pour beaucoup d'événements spéciaux Ocean City a à offrir tout au long de l'année. Pour ne en nommer que quelques-uns .... Springfest, quatrième des célébrations de juillet, tournois Marlin, Bikers semaine, Sunfest, Winterfest des lumières et beaucoup plus. Cette unité est disponible toute l'année et loué à la semaine (samedi au samedi) au cours de la saison. Les mini-semaines sont disponibles en basse saison avec un minimum de 3 nuits. Alors, venez, se détendre et profiter de notre lotissement et ont de belles vacances !!! We LOVED this place. It's our second family long weekend getaway for the Endless Summer Cruise car show weekend. The location was easy to get to and an easy walk to the boardwalk. Very clean, up to date and an over all homely house. We love it and plan to request the house again for next year! Thanks for the great review. We want our beach home to feel like home away from home for our renters. Look forward to renting to you again next year. This house was perfect for our family. There was plenty of room for everyone and the house was in excellent condition. We rarely used our cars as the house was a short walk to the boardwalk and beach. Paula is great to deal with too! I would highly recommend this house! Thank you!!! Thanks for the great review. The house is very spacious and as the reviewer said in a short distance from the beach/boardwalk. There are so many things to do within walking distance. Another great year staying in this beautiful house. The location is perfect, the house well maintained, and most important to us, it is spotlessly clean. Love having repeat customers. We strive to keep the house in excellent condition. We want families to feel right at home when they walk in the door. Thanks for the great review. We strive to keep the house in beautiful condition. We want families to feel like they are at a "home away from home". Great condo for a family reunion! Our family recently rented this condo for a week stay in Ocean City. 6 adults, 2 children and 2 babies shared this space with plenty of room for all. 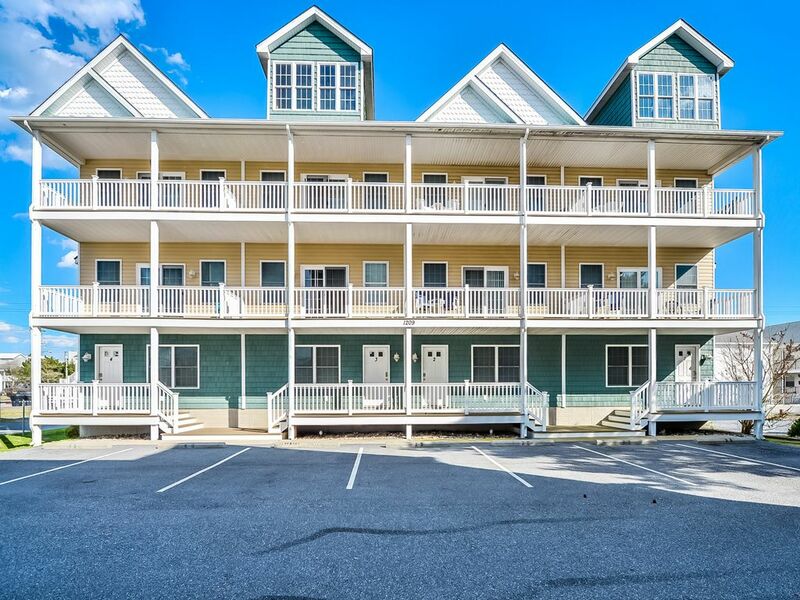 The location was convenient, with a short walk to the beach and boardwalk, and short drive to many restaurants and attractions. The whole family enjoyed our week in Ocean City! Refundable Security Deposit - Seniors in June is $1000 Refundable Security Deposit - Other times is $500 Senior Rates are from June 1, 2019 - June 22, 2019 No Senior Groups after June 22, 2019. If we approve a group for June 22-29 the rate will be the senior rate. Payment accepted is personal check or credit card (M/C & Visa). Rates are subject to change until reservation is confirmed.